Note to readers: If you enjoy my coverage of Northern California tennis, please donate on my homepage. Here's why I need your support. Victoria Azarenka won a marathon matchup of mothers. Azarenka, 28, of Belarus defeated Kateryna Bondarenko, 31, of Ukraine 6-3, 6-7 (7), 7-5 in 2 hours, 40 minutes tonight in the first round of the inaugural Mubadala Silicon Valley Classic in San Jose. Bondarenko, a former top-30 player who won the 2008 Australian Open doubles title with her sister Alona, saved three match points. Azarenka, a Belarus native who will turn 29 on Tuesday, gave birth to a son, Leo, in December 2016. Bondarenko, 31, of Ukraine had a daughter, Karin, in 2013. 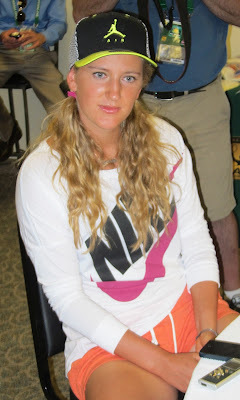 "It's a really challenging time for me and my game right now," Azarenka, ranked No. 108, said in an on-court interview. "You can see with my game, there's a lot of ups and downs. The important thing is I'm here, I'm fighting hard, and I try to do my best. That's all I can ask of myself, but it's not easy. Everyone expects to have results right awa -- I do, too! -- but I need to be patient and keep working hard." Azarenka, who won the 2010 Bank of the West Classic at Stanford, will face top-seeded Garbine Muguruza, 24, on Wednesday at 7 p.m. in a matchup of two-time Grand Slam singles champions and former world No. 1s. The top four seeds received first-round byes. In a late match, wild card Ashley Kratzer outlasted fellow American Alison Riske 6-4, 4-6, 7-5 for her first WTA tour victory. Kratzer, a 19-year-old left-hander, reached the semifinals in Berkeley two weeks ago and the final in Stockton last July. Both were $60,000 tournaments. Another 19-year-old American, Sofia Kenin, beat qualifier Veronica Cepede Royg of Paraguay 6-4, 6-4 during the day session. Kenin, who was born in Moscow and moved to the United States as a young child, reached the third round of the U.S. Open last year, losing to her idol, Maria Sharapova. Kenin also won Sacramento ($50,000) in 2016, Stockton in 2017 and Berkeley this month. Kenin will face either sixth seed and San Francisco resident Serena Williams or Johanna Konta of Great Britain. The former Bank of the West champions will meet Tuesday at 7 p.m.
Also advancing today were Danielle Collins of St. Petersburg, Fla., Maria Sakkari of Greece and Ajla Tomljanovic of Australia. Collins won the NCAA singles title in 2014 and 2016 while playing at Virginia. Here are the Mubadala singles and doubles draws and Tuesday's schedule. ATP World Tour in Washington, D.C. -- Former world No. 1 Andy Murray converted his seventh match point to beat Mackenzie McDonald, a 23-year-old product of Piedmont in the San Francisco Bay Area, 3-6, 6-4, 7-5 in the first round of the Citi Open. The match lasted 2 hours, 36 minutes and ended at 12:45 a.m. EDT. Murray recorded only his second victory after missing almost one year because of hip surgery. McDonald reached the fourth round at Wimbledon this month. Note to readers: If you enjoy my coverage of Northern California tennis, please donate on my homepage. Here's why I need your help. 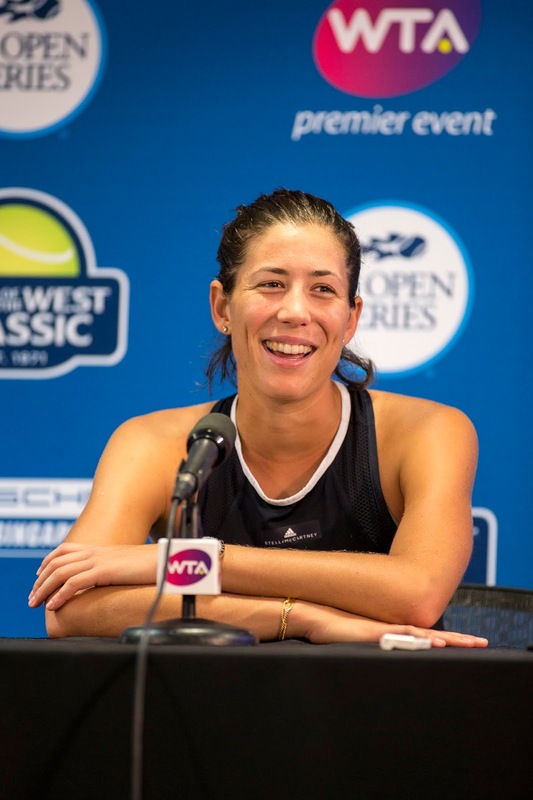 Top-seeded Garbine Muguruza is scheduled to play her opening match in the inaugural Mubadala Silicon Valley Classic at San Jose State on Wednesday at 7 p.m., tournament officials announced today. Also, second-seeded Madison Keys is set to open during the day session on Thursday. Muguruza, a two-time Grand Slam singles champion, and Keys, who won the Bank of the West Classic at Stanford and reached the U.S. Open final last year, received first-round byes. Muguruza will play the winner of Monday's 7 p.m. match between mothers Victoria Azarenka of Belarus and Kateryna Bondarenko of Ukraine. Azarenka, who will turn 29 on Tuesday, and Muguruza, 24, are former world No. 1s. Keys, 23, will meet the survivor of Monday afternoon's match between Ajla Tomljanovic of Australia and qualifier Georgina Garcia Perez of Spain. Previously, it was announced that sixth seed and San Francisco resident Serena Williams will play Johanna Konta of Great Britain in a matchup of former Bank of the West champions on Tuesday at 7 p.m.
Also, Venus Williams will meet either Heather Watson of Great Britain or Claire Liu, an 18-year-old wild card from Thousand Oaks in the Los Angeles region, on Thursday at 7 p.m. In today's final round of qualifying, the seventh-seeded Garcia Perez beat Maria Sanchez, a 28-year-old Modesto product, 7-6 (4), 7-6 (3). Eighth-seeded Amanda Anisimova, 16, of Aventura, Fla., edged second-seeded Anna Blinkova of Russia 5-7, 6-3, 7-6 (5). Anisimova is playing in her first tournament after missing four months with a broken foot. Here are the Mubadala singles and doubles main draws, complete qualifying draw and Monday's schedule. For more information, visit mubadalasvc.com. Three players with Northern California ties, including 15-year-old Connie Ma, won doubles titles in professional tournaments this weekend. And two, including Ma, reached singles finals. Third-seeded Jovana Jaksic, a Serbian based in Sacramento, and Renata Zarazua of Mexico topped unseeded Sanaz Marand and Whitney Osuigwe, 16, of the United States 6-3, 5-7 [10-4] in the final of the Braidy Industries $60,000 Women's Tennis Classic in Ashland, Ky.
Jaksic, 24, also reached the singles semifinals before losing to eventual champion Gail Brodsky. Unseeded Markus Eriksson and Andre Goransson (Cal, 2014-17) of Sweden edged Ivan Gakhov and Alexander Pavlioutchenkov of Russia 6-3, 3-6 [10-7] to capture the 43,000 Euro ($50,129) Aamulehti Tampere (Finland) Open. Ma -- a 5-foot-3 (1.60-meters), 95-pound (43.1-kilogram) amateur from Dublin in the San Francisco Bay Area -- and Gianna Pielet, 16, beat Meghan Kelley and Bianca Moldovan 6-3, 7-5 in an all-American final in the $15,000 Women's Hospital Classic in Evansville, Ind. Both teams were unseeded. Kelley and Moldovan will be seniors at Virginia and North Carolina State, respectively. The Ashland singles final featured a rare matchup of qualifiers as Brodsky, 27, defeated fellow American Maegan Manasse (Cal, 2014-17) 4-6, 6-1, 6-0. In the Evansville final, third-seeded Elysia Bolton of Cold Spring Harbor, N.Y., beat the sixth-seeded Ma 6-3, 4-6, 6-3. Bolton will enroll at UCLA in the fall. Former world No. 1s Venus Williams and Victoria Azarenka are scheduled to play Thursday and Monday, respectively, in the inaugural Mubadala Silicon Valley Classic at San Jose State, tournament officials announced today. Both matches are set for 7 p.m. The third-seeded Williams, who won the last of her seven Grand Slam singles titles 10 years ago, will play either Heather Watson of Great Britain or Claire Liu, an 18-year-old wild card from Thousand Oaks in the Los Angeles region. The top four seeds received first-round byes. Azarenka, the Australian Open champion in 2012 and 2013, will meet Kateryna Bondarenko of Ukraine. The winner will take on another former world No. 1, top-seeded Garbine Muguruza, on Wednesday at a time to be determined. Williams is ranked 14th at age 38. Azarenka, who will turn 29 on Tuesday, has tumbled to No. 110 after having her first child in December 2016 and playing part-time because of a custody battle. In the opening round of qualifying today, Maria Sanchez scored the first top-50 singles win of her career. The 28-year-old Modesto product, ranked No. 258, upended Aryna Sabalenka, ranked No. 35 and seeded first, 2-6, 7-5, 6-4. Sabalenka, 20, of Belarus reached the Eastbourne final on grass in June, ousting seventh-ranked Karolina Pliskova in the quarterfinals and losing to second-ranked Caroline Wozniacki. Sanchez will face No. 7 seed Georgina Garcia Perez, a 6-foot-1 (1.87-meter) Spaniard, on Sunday after a 10 a.m. match between No. 2 Anna Blinkova of Russia and Amanda Anisimova, a 16-year-old U.S. phenom seeded No. 8. Anisimova, playing her first match after missing four months with a broken foot, dismissed Priscilla Hon of Australia 6-1, 6-3. Anisimova won her first professional title in the $60,000 Sacramento Challenger last July and reached the fourth round at Indian Wells in March, beating Petra Kvitova for her first top-10 victory. Nicole Gibbs (Stanford, 2011-13) lost to fellow Southern Californian Danielle Lao, only 5-foot-3 (1.61 meters) and 120 pounds (54 kilograms), 3-6, 6-2, 6-2. Here are the singles main draw, qualifying draw and Sunday's schedule. For more information, visit mubadalasvc.com. In a matchup of former Bank of the West Classic champions, No. 6 seed Serena Williams will face Johanna Konta on Tuesday at 7 p.m. in the Mubadala Silicon Valley Classic at San Jose State. The draw for the inaugural tournament, which replaces the Bank of the West Classic at Stanford, was held tonight. The main draw will begin Monday with sessions at 10 a.m. and 7 p.m.
Williams played in the Bank of the West five times, capturing the title the last three (2011, 2012 and 2014). Konta took the 2016 crown in her only appearance in the tournament. Williams won her only match against Konta 6-2, 6-3 in the quarterfinals of the 2017 Australian Open en route to the title. That was Williams' last tournament before going on maternity leave. Williams has played four tournaments since having her first child on Sept. 1. Ranked No. 27, she is coming off a runner-up finish at Wimbledon two weeks ago. Williams, 36, was bidding to tie Margaret Court's record of 24 Grand Slam singles titles. Konta, 27, of Great Britain has tumbled from a career-high No. 4 last July to No. 48. She lost in the second round at Wimbledon, also her last tournament. The winner of Tuesday night's match will play either Sofia Kenin, a 19-year-old American who won last week's $60,000 Berkeley Tennis Club Challenge, or a qualifier to be determined. The top four seeds in the Silicon Valley Classic -- in order, Garbine Muguruza, Madison Keys, Venus Williams and Elise Mertens -- received first-round byes. Muguruza reached the Bank of the West semifinals last year and quarterfinals in 2014 and won the doubles title in 2014 with fellow Spaniard Carla Suarez Navarro. Venus Williams won the Bank of the West in 2000 and 2002, and Keys took last year's crown. Muguruza could play Victoria Azarenka, the 2010 Bank of the West champion, in the second round in a clash of former world No. 1s. Azarenka, 28, is ranked No. 110 after having her first child in December 2016 and playing a limited schedule because of a custody battle. The Williams sisters could meet in the Aug. 5 final. In the first round of qualifying on Saturday, 16-year-old U.S. phenom Amanda Anisimova, seeded eighth, is scheduled to launch her comeback against Priscilla Hon of Australia at 10 a.m. Anisimova has missed the last four months with a broken foot. Anisimova won her first professional title in the $60,000 Sacramento Challenger last July and reached the fourth round at Indian Wells in March, beating Petra Kvitova for her first victory over a top-10 player. Maria Sanchez, a 28-year-old Modesto product ranked No. 258, will take on top-seeded Aryna Sabalenka, a 20-year-old Belarusian ranked No. 35, at about 2 p.m. After that match, third-seeded Nicole Gibbs (Stanford, 2011-13) will play 5-foot-3 (1.61-meter), 120-pound (54-kilogram) Danielle Lao in a battle of Southern Californians. Gibbs lost to Kenin in the Berkeley final. Sixteen players are entered in qualifying. Those who win two matches will advance to the main draw. Here are the singles main draw, qualifying draw and Saturday's schedule. For more information, visit mubadalasvc.com. Two of the United States' top prospects, Southern California teenagers Claire Liu and Ashley Kratzer, received main-draw wild cards for next week's Mubadala Silicon Valley Classic at San Jose State, tournament officials announced today. Liu (pronounced Loo), 18, of Thousand Oaks and Kratzer, a 19-year-old left-hander from Newport Beach, join former world No. 1s Venus Williams and Garbine Muguruza as the tournament's wild cards. The draw for the Silicon Valley Classic, which replaces the Bank of the West Classic at Stanford, will be held Friday at 6 p.m. Qualifying will begin Saturday and the main draw on Monday. Both sessions will start at 10 a.m. The field also includes Bank of the West champions Serena Williams (2011, 2012 and 2014), Victoria Azarenka (2010), Johanna Konta (2016) and Madison Keys (2017). Liu, ranked No. 153, has qualified for three tour-level events and played in the main draw of two others this year. She reached the second round at Wimbledon this month and was the only player to win a set there against eventual champion Angelique Kerber. Last year, Liu became the first American to win the Wimbledon girls title since Chanda Rubin in 1992, reached the French Open girls final and climbed to No. 1 in the world junior rankings. Kratzer, ranked No. 249, has advanced to the semifinals or better at four ITF (minor-league) events in 2018, including the final of a $25,000 event in Naples, Fla. in early June and the semifinals of last week's $60,000 Berkeley Tennis Club Challenge. Last summer, Kratzer reached the final of the $60,000 Stockton (Calif.) Challenger and won the USTA Girls' 18s National Championships in San Diego to earn a wild card in the main draw of the U.S. Open. She lost in the opening round at Flushing Meadows to Germany's Tatjana Maria, then ranked 61st, 6-1, 6-1. For more information on the Mubadala Silicon Valley Classic, visit mubadalasvc.com. CoCo Vandeweghe, a two-time runner-up in the Bank of the West Classic at Stanford, withdrew from next week's Mubadala Silicon Valley Classic at San Jose State with an ankle injury, tournament officials announced today. Vandeweghe reached the Stanford final in 2012 as a lucky loser, falling to Serena Williams, and last year, losing to her close friend Madison Keys. After advancing to her first two Grand Slam semifinals, in the Australian Open and U.S. Open, and the French Open quarterfinals in 2017, Vandeweghe has won one match in a major this year. She has dropped from a career-high No. 10 last November to No. 19. Fellow American Christina McHale, who won the USTA Girls' 18s National Championships in 2009 at the Berkeley Tennis Club, will replace Vandeweghe in the San Jose draw. McHale is ranked No. 97 after climbing as high as No. 24 in 2012. The Silicon Valley Classic, which replaces the Bank of the West Classic, features former world No. 1s Serena Williams, Venus Williams, Garbine Muguruza and Victoria Azarenka. Also entered are past Bank of the West champions Johanna Konta (2016) and Keys. Tickets are available at mubadalasvc.com. Two Northern California juniors won titles in last week's USTA National Clay Court Championships, and two others reached finals. No. 8 seed Allura Zamarripa of Saint Helena in the Napa area beat No. 1 Valencia Xu of Livingston, N.J., 6-4, 6-3 in the girls 16 final in Memphis, Tenn.
Zamarripa and her twin sister, Maribella, swept the girls 16 doubles titles in the Easter Bowl at Indian Wells, Calif., and the USTA International Spring Championships in Carson, Calif., in consecutive weeks in the spring. Meanwhile, No. 1 seed Rudy Quan of Roseville in the Sacramento area routed No. 6 Luca Coriaty of Long Beach, Calif., 6-1, 6-1 in the boys 12 final in Orlando, Fla.
Quan also won the USTA National Winter Championships in Tucson, Ariz., and the Easter Bowl in the 12s this year. Allura Zamarripa is ranked 16th nationally in the 16s in singles, and Quan is No. 1 in the 12s. In the boys 14 final in Fort Lauderdale, Fla., No. 3 Nicholas Heng of Madison, Ala., overcame No. 2 John Kim of Sunnyvale in the San Francisco Bay Area 5-7, 6-4, 6-3. And in the girls 14 final in Plantation, Fla., unseeded Clervie Ngounoue of Washington, D.C., topped No. 1 Vivian Ovrootsky of San Jose 6-4, 4-6, 6-2. Valley Classic, July 30-Aug. 5 at San Jose State. The field of former No. 1-ranked players in the Mubadala Silicon Valley Classic is getting crowded. Garbine Muguruza became the fourth one, tournament officials announced today. Muguruza, 24, joins former world No. 1s Serena Williams, Venus Williams and Victoria Azarenka in the inaugural tournament, July 30-Aug. 5 at San Jose State. Maria Sharapova, who also climbed to the top of the rankings, withdrew last Tuesday to rest. The Silicon Valley Classic replaces the Bank of the West Classic, which ended a 21-year run at Stanford last August. Muguruza, the Williams sisters and Azarenka have won multiple Grand Slam singles titles. Muguruza took the 2016 French Open and 2017 Wimbledon crowns. Muguruza last September became the first Spanish woman to reach No. 1 since Arantxa Sanchez Vicario in 1995. Muguruza was born in Venezuela to a Venezuelan mother and Spanish father. This year, Muguruza reached the French Open semifinals, losing to eventual champion Simona Halep, and was upset by Alison Van Uytvanck of Belgium in the second round at Wimbledon. The seventh-ranked Muguruza has won six career WTA titles in singles, including Monterrey in April, and five in doubles, including the Bank of the West Classic in 2014 with compatriot Carla Suarez Navarro. Muguruza played in the Bank of the West Classic twice, reaching the singles quarterfinals in 2014 and semifinals last year. She lost to eventual champion Madison Keys in 2017. Bank of the West singles champions entered in San Jose are Serena Williams (2011, 2012 and 2014), Venus Williams (2000 and 2002), Azarenka (2010), Johanna Konta (2016) and Keys. Also in the field is CoCo Vandeweghe, a two-time Bank of the West runner-up. Tickets to the Silicon Valley Classic are available at MubadalaSVC.com. BERKELEY, Calif. -- After reaching her first WTA tour semifinal in Mallorca on grass and advancing to the second round at Wimbledon for the first time, Sofia Kenin easily could have suffered a letdown in the inaugural $60,000 Berkeley Tennis Club Challenge. But that's not her style. Put her on a court, and she's ready for battle. After all, she has Russian heritage. "I think it helps me because Russians are determined and always fight," said the 19-year-old American, who was born in Moscow and speaks Russian with her father and coach, Alex. "I got that from my family." The top-seeded Kenin never lost a set in five Berkeley matches (although she played two tiebreakers), capping her run with a 6-0, 6-4 victory over second-seeded Nicole Gibbs, a 25-year-old former Stanford star, in 65 minutes today. "Obviously it's hard to adjust coming from Wimbledon where everything is so glorious and here it's not so much," said Kenin, who beat No. 6 Caroline Garcia of France in Mallorca for her first win over a top-10 player. "But I like the site; I like playing here." The Berkeley Tennis Club has a rich history of its own. It was founded in 1906, and past members include International Tennis Hall of Famers Don Budge, Helen Wills Moody, Helen Jacobs and Hazel Wightman. Plaques in their honor adorn the interior and exterior of the clubhouse. Hall of Famers Rod Laver, Ken Rosewall, Stan Smith and Billie Jean King have played at the Berkeley Tennis Club, and King is an honorary lifetime member. The USTA Girls 18 National Championships were held there until the tournament moved in 2010 to its current site in San Diego. Kenin, who has piercing blue eyes and also goes by "Sonya," won a Northern California Challenger for the third consecutive year, following Sacramento ($50,000) in 2016 and Stockton ($60,000) last summer. Her only other title in a professional tournament came in Wesley Chapel, Fla. ($25,000) on clay in 2016. Kenin, who will remain about No. 64 in Monday's updated rankings, does not plan to play any more Challengers. "As of now, I don't really think so," she said. "I wasn't supposed to play this one. We just decided to get some match play." Kenin said she would fly back home to Pembroke Pines, Fla., in the Miami area tonight and return to the San Francisco Bay Area for the inaugural Mubadala Silicon Valley Classic, July 30-Aug. 5 at San Jose State. Kenin easily is ranked high enough to play in the main draw of the U.S. Open, Aug. 27-Sept. 9 in Flushing Meadows, N.Y., for the fourth straight year. She reached the third round there last year, losing to her idol, Maria Sharapova, 7-5, 6-2 in a late-night match at 23,771-seat Arthur Ashe Stadium. Kenin then turned pro so she could keep her $144,000 prize money. "I'm already in the middle of the (entry list), which takes a lot of pressure off instead of playing three tournaments for the wild card," said Kenin, who earned $9,119 for the Berkeley title. Kenin hopes to move to New York and then California. "I have to make a lot of money to get there," she cautioned. "I love Manhattan. It's so nice. It has the best restaurants and the best shops in the world. I love big shops." Kenin -- among a group of teenage U.S. prospects that also includes CiCi Bellis (19), Ashley Kratzer (19), Caroline Dolehide (19), Claire Liu (18), Kayla Day (18), Amanda Anisimova (16), Whitney Osuigwe (16) and Cori Gauff (14) -- is well on her way. Kenin's goal is to crack the top 50 by the end of the year. Gibbs isn't betting against her. "She's a good tennis player," said Gibbs, who took home $4,863. "I don't see any reason she won't be top 20 (eventually)." In addition to tenacity, Kenin has "a killer (two-handed) backhand," according to Gibbs, and a phenomenal drop shot. The 5-foot-7 (1.70-meter) Kenin's serve, although not a big weapon, and forehand aren't exactly shabby, either. Asked if she's ever played anyone with a better drop shot, Gibbs declared with a laugh: "Nope. She has an unbelievable drop shot. I knew it was coming, and I still couldn't cover it today." Gibbs hadn't lost a set in the tournament -- she won the doubles title with Asia Muhammad on Saturday -- entering the singles final. That changed in a hurry as Kenin, ripping service returns and groundstrokes, blitzed Gibbs in 18 minutes in the opening set of their first career meeting. When Kenin also broke serve, on a forehand cross-court winner, to open the second set, it looked bleak for Gibbs. But she broke right back when Kenin -- looking mortal, after all -- netted a down-the-line backhand. That prompted Gibbs to raise her palms, as if to say, "Finally." The crowd of about 200 enthusiastic fans on another beautiful day strongly backed Gibbs, either because she played at nearby Stanford or it wanted a competitive match or both. After the players traded breaks again for 3-3, Kenin scored the decisive break. From 30-30, she floated yet another feathery drop shot for a winner, and Gibbs sailed a forehand long, causing her to scream in frustration. Gibbs held for 4-5, saving one match point, but Kenin earned three more match points at 40-0 in the next game. Kenin netted a backhand on the first one but converted the second one. The 5-foot-6 (1.68-meter) Gibbs lost her serve six of eight times and won only 26 percent of the points on her second serve (6 of 23). Asked if Kenin was just too good in the final, Gibbs replied with a laugh: "Yeah, and I was too bad. It was a perfect storm a little bit. She played really well and took me off my game. I just didn't have nearly the consistency I had earlier this week. The ball felt like it was flying a little bit off my racket today. I'm not sure if it was the conditions or I just wasn't adjusting with my feet. She certainly played really well to take it away from me, but I also gave her a lot of points that I didn't need to give her. "Everything was kind of a struggle today. I felt a little bit out of sorts, and part of that is credit to your opponent. She was taking my serve really early, even off the first serve, so I felt like I had to do more, and I just didn't execute." Gibbs also complained of "normal finals nerves. I didn't sleep great last night. It is what it is. It's part of the game." Gibbs, who reached a career-high No. 68 two years ago, will rise from No. 116 to about No. 105. She plans to train at home in Venice in the Los Angeles area next week, then play in San Jose. "I think I'm four (spots) out of the main draw, so it's probably 50-50 whether I'll have to qualify," she said. The tournament replaces the Bank of the West Classic, which ended a 21-year run at Stanford last year. "I'm bummed that it's not at Stanford, but it is what it is, and I'm looking forward to coming back up next week." Here are the complete Berkeley singles and doubles draws. to beat fourth-seeded Kristie Ahn 6-4, 2-6, 6-1. BERKELEY, Calif. -- There will be no all-Stanford semifinal. Nor will there be an all-Japanese semifinal. Two 19-year-old Americans, one right-handed and one left-handed, saw to that. But not to worry. The semis in the $60,000 Berkeley Tennis Club Challenge remain plenty enticing. Unseeded Ashley Kratzer, the lefty, ousted fourth-seeded Kristie Ahn, a 26-year-old Stanford graduate, 6-4, 2-6, 6-1 in Friday's quarterfinals. In a matchup of former Sacramento Challenger champions, top-seeded Sofia Kenin of Pembroke Pines, Fla., beat eighth-seeded Mayo Hibi of Japan 6-1, 6-4. Hibi, 22, was born in Japan but lived in Foster City in the San Francisco Bay Area as a young child and grew up in Irvine in the Los Angeles area. Kratzer will take on second seed and fellow Southern Californian Nicole Gibbs today at 11. Gibbs and Ahn led Stanford to the 2013 NCAA championship. "I'm disappointed for Kristie," said Gibbs, 25. "However, I'm always glad not to have to play her. It's never fun playing a really good friend." Kenin, who was born in Moscow but moved to the United States as a young child, will meet another Japanese player, third-seeded Nao Hibino, following the Gibbs-Kratzer match. After Kratzer double-faulted to lose her serve in the opening game of the third set against Ahn, she reeled off six straight games for the match. "I kind of dug deep and remembered back to yesterday, how much energy and my whole self I put into it," Kratzer said, referring to her 5-7, 6-4, 7-6 (7) victory over little Danielle Lao in 3 hours, 9 minutes. Kratzer escaped a match point at 6-7 in the tiebreaker. "I knew I had the match under control. I just needed to settle down and figure out what was working." The turning point came with Ahn serving at 1-2, 40-0 in the third set. Kratzer won the next five points to break and then overwhelmed Ahn with a barrage of passing shots. "She hit some really good returns," said the 5-foot-5 (1.68-meter) Ahn, who's based in Boca Raton, Fla. "Maybe I wasn't aggressive enough, but I didn't play badly. I needed to raise my level a little bit more because obviously she did, and she took advantage of it, and obviously it changed the tone of the match." Ahn took a medical timeout early in the second set to have her lower back massaged. Asked if her back bothered her in the third set, Ahn said, "It wasn't great, but it's something you have to play through," before adding sheepishly, "It's from period cramps. I don't like to ... the timing is just unfortunate." Gibbs dismissed fifth-seeded Jamie Loeb, a 23-year-old product of the John McEnroe Tennis Academy in New York, 6-3, 6-2 in 61 minutes in a clash of ex-NCAA singles champions. Gibbs turned pro after winning her second consecutive NCAA singles title in 2013 as a junior (in addition to capturing the 2012 doubles crown with Mallory Burdette). Loeb made the leap after taking the 2015 title as a North Carolina sophomore. Gibbs, ranked No. 116 after reaching a career-high No. 68 two years ago, and Kratzer, ranked No. 231, have split two career matches. Kratzer won 2-6, 7-5, 6-3 in the second round of an $80,000 hard-court tournament in Tyler, Texas, last fall, and Gibbs triumphed 6-4, 6-4 in the final of a $25,000 clay-court event in Naples, Fla., in early June. "She's explosive, she's extremely talented, she's an athlete," said Gibbs, who has reached the third round of a Grand Slam twice and extended then-No. 1 Karolina Pliskova to 6-4 in the third set in the second round of the U.S. Open last September. "I'm definitely looking forward to the contest tomorrow." Kratzer, who last summer reached the final of the $60,000 Stockton Challenger (losing to Kenin) and won the USTA girls 18 hardcourt title, said Gibbs "definitely is looking to move forward and trying to attack off the first ball. It's definitely going to be who can make the most balls tomorrow but also staying super offensive." Ahn said she could not stay for Gibbs' match but would watch the live stream. "I'm curious about that match as well," said Ahn, who is scheduled to play in a $60,000 tournament in Ashland, Ky., next week. "I'm sure it will be a really good match." Kenin's athleticism and flat groundstrokes proved to be too much for the slightly built Hibi, but Kenin was frustrated at times by Hibi's unorthodox game. Hibi gives opponents little pace, slices every backhand, chases down almost everything and has a good drop shot and volley. "She has good hands and a good slice, and she comes to the net really well," said the 64th-ranked Kenin, who reached the third round of the U.S. Open last year and the second round at Wimbledon this month. "It's really tough to play someone like her. "I had to try to somehow (produce) my own pace. Against players like that, people overhit and miss everything. I tried to be patient." young child, follows through on her trademark slice backhand. Hibino, the champion of last week's $60,000 Honolulu Challenger, extended her winning streak to eight matches with a 7-6 (3), 6-1 victory over seventh-seeded Francesca Di Lorenzo, a 20-year-old left-hander from New Albany, Ohio. Kenin and Hibino, ranked No. 113 after climbing to a career-high No. 56 in 2016, will meet for the first time in a matchup of past Stockton Challenger champions. "I didn't really watch her before my match because I didn't want to look ahead," Kenin said. "From what I saw, she hits flat, moves well and fights for every point." Gibbs also will play for the doubles title after today's second singles semifinal. She and Asia Muhammad of the United States will face top-seeded Ellen Perez of Australia and Sabrina Santamaria of the United States. Gibbs and Muhammad beat Di Lorenzo and Jovana Jaksic, a Serbian living in Sacramento, 6-4, 6-3.
ber 2016 in Burlingame in the San Francisco Bay Area. BERKELEY, Calif. -- CiCi Bellis won't play in her home tournament in two weeks. Or likely anywhere else this year. The 19-year-old sensation, who was born in San Francisco and grew up in nearby Atherton, underwent surgery for a torn ligament in her right wrist on June 27 at the Mayo Clinic in Rochester, Minn. Bellis is right-handed with a two-handed backhand. The inaugural Mubadala Silicon Valley Classic on the WTA tour is scheduled for July 30-Aug. 5 at San Jose State. The tournament replaces the Bank of West Classic, which ended a 21-year run at Stanford last year. Dr. Richard Berger, who performed multiple surgeries on Juan Martin Del Potro's wrists, operated on Bellis. "The surgery went well," Bellis' coach, Anibal Aranda, said Thursday. "She's at home now taking some time off to recover and come back healthy and strong." Aranda, a national women's coach for the USTA, spoke at the $60,000 Berkeley Tennis Club Challenge, where he's working with Ashley Kratzer and Grace Min. Kratzer, a 19-year-old left-hander, upset the sixth-seeded Min in the first round and is scheduled to play fourth-seeded Kristie Ahn (Stanford, 2011-14) in the quarterfinals today at noon. Bellis, who reached a career-high No. 35 in August and was named the WTA Newcomer of the Year, has not granted any interviews, her agent, Marijn Bal, wrote in an e-mail. Wrist surgery has become increasingly common in professional tennis, even on the left wrists of right-handers with two handed backhands, such as Del Potro. Aranda said Bellis' right wrist began bothering her in February. "It started a little bit this year when we went to Doha and Dubai. Then by Miami (in late March), she couldn't play anymore. At the beginning of the year, she played against big hitters, and the balls and surfaces changed. 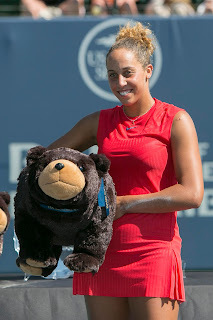 She played Madison Keys, (Karolina) Pliskova, (Victoria) Azarenka, (Elena) Vesnina (and Garbine Muguruza). It's the same thing that happened to (Kei) Nishikori and Del Potro," Aranda said. Bellis, who now lives in Orlando, Fla., plans to return at the beginning of next year, Aranda added. A petite 5-foot-7 (1.68 meters), she also missed the first month of 2017 with a strained gluteus muscle. Bellis has dropped to No. 87 and will plunge further. However, WTA rules allow her to use her ranking of No. 44 when she last played to gain entry into eight tournaments within one year of her return. Serena Williams will play her opening-round match in the Mubadala Silicon Valley Classic on Tuesday, July 31, at 7 p.m., tournament officials announced Thursday. Williams' opponent will be determined when the draw is held next Friday. The tournament, which replaces the Bank of the West Classic at Stanford, is scheduled for July 30-Aug. 5 at San Jose State. Williams is scheduled to play in the San Francisco Bay Area for the first time since 2014, when she won the Bank of the West title for the third time. Bidding to tie Margaret Court's record of 24 Grand Slam singles titles, Williams lost to Angelique Kerber in the Wimbledon final last Saturday. It was Williams' fourth tournament since she had her first child last Sept. 1. The San Jose field also includes former Bank of the West champions Venus Williams (2000 and 2002), Victoria Azarenka (2010), Madison Keys (2017) and Johanna Konta (2016) and two-time runner-up CoCo Vandeweghe (2012 and 2017). BERKELEY, Calif. -- Nicole Gibbs just wants to be average. Off the court, that is. And Gibbs, who went public in January with her battle against depression in an effort to help others, is succeeding. "I'm actually doing awesome," the second-seeded Gibbs said after beating Jovana Jaksic 6-2, 6-4 on Wednesday in the first round of the inaugural $60,000 Berkeley Tennis Club Challenge. "I got off my meds not too long ago, and I'm feeling pretty normal, like kind of your average person, which is a good thing for me. I'm definitely turning in the right direction, I have an awesome support team around me, and I haven't had any problems lately." Gibbs is far from the only professional player to struggle with depression. Andre Agassi, Pat Cash, Cliff Richey, Mardy Fish, Victoria Azarenka, Ashleigh Barty and Rebecca Marino also have dealt with mental health issues. "I think people susceptible to depression are just wired a little differently," said Gibbs, who first exhibited symptoms in high school. "The same challenges that might be frustrating in a normally wired person's life become these bigger things in the life of a person susceptible to depression. That being said, there's always something you can do. For me, that's mindfulness and just being really dedicated to managing my meds." But pro tennis exacerbates the problem. Ranked a career-high No. 68 two years ago, Gibbs has dropped to No. 116. "When you're not inside the top 50, tennis is a constant identity crisis," Gibbs, a petite 5-foot-6 (1.68 meters) in an age of power, told the Telegraph of Great Britain in January. "You ask yourself questions all the time. What can I be doing to do better? Am I doing everything I can? How do I get to that next level where I really want to be? There were times when the up-and-down elements of tennis made things almost unbearable for me." Gibbs concedes that dealing with depression while playing pro tennis "is a huge challenge, but I'm also really grateful for it because it's forced me to confront this stuff earlier in life than I would have necessarily otherwise." Gibbs, a 25-year-old resident of Venice in the Los Angeles area, and Jaksic, a 24-year-old Serb, are both emotional players with strong Northern California ties. Gibbs played at Stanford, winning two NCAA titles in singles (2012 and 2013) and one in doubles (2012) before turning pro one year early. She met her fiance, Jack Brody, there. Jaksic moved from Las Vegas to Sacramento in December 2016. Her Serbian boyfriend, Vuja Jovic, is a real estate broker in Sacramento. Gibbs rallied from second-set deficits of 3-0 and 4-1 at the Berkeley Tennis Club, founded in 1906. Past members include International Tennis Hall of Famers Don Budge, Helen Wills Moody, Helen Jacobs and Hazel Wightman. Plaques honoring Budge and Willls Moody adorn the clubhouse. "I'm happy with the way I competed," said Gibbs, who extended then-No. 1 Karolina Pliskova to 6-4 in the third set in the second round of the U.S. Open last September. "I played a pretty solid first set, then she raised her level, and I got a little unlucky. I think I had ad points in all three of the first games of the second set and ended up down 0-3. That's always a little bit of a mental challenge when you feel like you've done all the work to be on the right side of the momentum, and then the opponent takes it away from you. I really had to battle to even things up and then take the set. "I view it as the perfect first round. I definitely did some good things, there are a lot of things I can do a lot better in the next round, and I got challenged." When the 322nd-ranked Jaksic was asked what gave her the most trouble, she cracked, "Me, myself and I. That's always the biggest opponent I have -- I mean everyone has -- being comfortable with myself on the court, which I'm clearly not. I started to a little bit in the second set, but it's still not where I want to be. "She's definitely a good player. I had a tough draw. It's tough to play a former top-100 player in the first round. It is what it is; I have to accept it." in a showdown of former Pacific-12 Conference standouts. The 5-foot-11 (1.80-meter) Jaksic almost climbed into the top 100 at No. 102 in May 2014, shortly after reaching the final in Monterrey, Mexico. She lost to countrywoman and former world No. 1 Ana Ivanovic in the WTA tournament. What has happened since then? You name it. "Injuries, I moved to the States, I had training problems, coaching problems ... injury problems the most because a back injury kept coming back for four years and is still present," said Jaksic, adding that she has four herniated discs because one of her former coaches had her do too much weight training. "It's always tough getting through an injury, not only physically but mentally. I lost confidence." Jaksic said Novak Djokovic, who won his first Grand Slam title in more than two years on Sunday at Wimbledon, is "a good friend of mine." Both were born in Belgrade (as was Ivanovic). "I've known him since a young age," Jaksic continued. "Our parents knew each other since before I was born. I'm really, really proud of him for winning Wimbledon. I believed in him, even though most people didn't. It really means a lot to him. "You could see the way he behaved ever since he was young how extremely motivated he was and how much he worked, so it was really inspiring for everyone. Players should learn from his example." Gibbs will face Maria Sanchez, a 28-year-old Modesto product, in a Pacific-12 Conference showdown today at about 2 p.m. Sanchez, a former USC All-American, said she has split two matches with Gibbs, winning in college and losing in the pros. The latter match occurred five years ago. Sanchez, ranked No. 271, dominated Kimberly Birrell of Australia 6-2, 6-2. "I felt like I served smart and served well in important moments, so I think that helps my whole game," said Sanchez, who has won two titles in singles and 20 in doubles on the ITF (minor-league) circuit and one doubles crown on the (major-league) WTA Tour. "I was pretty solid from the baseline. I really liked it when I got forward and used my volleys. I was happy with the way I competed." Sanchez won't be thinking about her college days when she faces Gibbs. "That was a little while ago. A lot has changed since then. I just consider it another tough match in the tournament," she said. In another matchup of former Pac-12 players, fourth-seeded Kristie Ahn, who led Stanford to the 2013 NCAA title along with Gibbs, will meet wild card Maegan Manasse from Cal at 10 a.m. The only seed to fall in the first round was No. 6 Grace Min, who lost to fellow American Ashley Kratzer, a 19-year-old left-hander, 6-4, 6-4. Min and Kratzer advanced to Challenger finals in Sacramento in 2016 and Stockton in 2017, respectively. Shortly after Stockton last July, Kratzer won the USTA girls 18 hardcourt title to earn a wild card into the U.S. Open and lost to German veteran Tatjana Maria 6-1, 6-1 in the opening round. In an all-Japanese clash, No. 3 seed Nao Hibino topped former top-30 player Misaki Doi 6-4, 6-4. Hibino won last week's $60,000 Honolulu Challenger and the inaugural 2015 Stockton Challenger. Doi held a match point against Angelique Kerber in the first round of the 2106 Australian Open but lost. Kerber went on to win the first of her three Grand Slam singles titles. No. 8 seed Mayo Hibi of Japan routed 15-year-old qualifier Connie Ma of Dublin in the San Francisco Bay Area 6-0, 6-3. Hibi was born in Japan but lived in Foster City in the Bay Area as a young child and grew up in Irvine in the Los Angeles area. She won the 2013 Sacramento Challenger at age 17. Ma, ranked seventh nationally in the 16s at only 5-foot-3 (1.60 meters) and 95 pounds (43.1 kilograms), pronounced herself happy with her performance in the tournament. "I was just hoping to make it past a couple rounds of qualifying, and I did that," said Ma, who reached the quarterfinals of a $25,000 hard-court tournament in Baton Rouge, La., last month as a qualifier. Here are the Berkeley singles and doubles draws and Thursday's schedule.